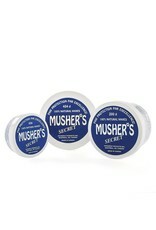 Musher’s Secret was developed in Canada for use on mushing dogs in the ice and snow. A protective barrier is formed to create an invisible bootie. Yellow Beeswax, Carnauba, and Candelilla Wax) and oils with Vitamin E.
into the paws, allowing perspiration to escape through the toes. All-season paw protection for your dog. cactus, rocks, broken glass, dryness, and more.